This course provide students with the knowledge and resources required to perform all the necessary steps in developing a comprehensive emergency management program (EMP) for institutions of all sizes. Modules in emergency planning, response and recovery will guide planners at all levels of school administration in their efforts to develop and maintain viable allhazards, all-threats EMPs. A leadership component provides a methodical way to engage schools and surrounding communities in examining the life cycle of a potential crisis, determining required capabilities, identifying resources and establishing a framework for roles and responsibilities. In today’s times, school faculty and staff must be ready to respond efficiently and appropriately to internal and external threats. The course introduces participants to the roles and responsibilities of school security, laws and liability, security awareness in the educational environment, dynamics of student behavior, campus and community problem solving, conflict resolution and mediation, and disaster preparedness. Topics include: history and development of campus security, school security officers’ authority both on and off duty, responsibilities in the educational environment AND professional image, and school structure and organization as they relate to campus personnel, ancillary groups and constituent groups. The course is intended for K-12 school or California community college security personnel, as well as any school stakeholder including school board members, aides, and counselors. Participants will gain the tools necessary to maintain a safe and secure environment. This course meets the requirements under California Education Code 38001.5 for individuals serving in K-12 and Community Colleges. The impact of a disaster on children with disabilities is expected to be greater than the impact on the general population. This four hour course is designed for school and district personnel and covers preparing for and responding to the school-based disaster needs of students with disabilities and access and functional needs. Areas addressed include communication and warning, evacuation, technology-dependence, assistance with personal tasks, feeding, toileting, medication and medical protocols, and transportation. 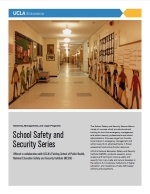 The School Security for Educators course specifically focuses on common challenges schools face yet have the potential to escalate into a critical incident. Participants learn effective strategies to address bullying, threats, gang activity, and other forms of school violence. The course also covers how educators should prepare for a critical incident by learning how to create crisis communication plans, assess school threats, and reevaluate school emergency procedures. The course is highly interactive and involves tabletop and role-play exercises, and case-study discussions. It is intended for school faculty, staff, and administrators. Participants gain the skills to prevent, and prepare and manage a school crisis. This course will train school and school district officials to conduct campus vulnerability assessments in order to prevent or reduce the consequences of man made or natural disasters. Participants will learn the critical components of the vulnerability assessment process such as identifying hazards and risks, and reporting and prioritizing campus vulnerabilities. The course also covers forming effective assessment teams and how to identify additional considerations in vulnerability assessments unique to the participants’ campus. The School Vulnerability Assessments course is designed for school facilities and security personnel. Participants completing the course will have gained a strong grasp of the vulnerability assessment process, and will have the confidence to begin the process to strengthen the infrastructure of their campus. Schools and workplaces are continuing to receive threats within the organization or from the outside. Staff are often in the frontlines of these threats and are often expected to diffuse the situation. An untrained staffer can potentially escalate the situation, which can result in violence. The threat assessments teams course teaches participants not only how to manage a crisis but how to prevent a crisis from escalating. The course covers establishing threat assessments teams, methodically assessing potential threats, legal implications, and responding to threats. The Threat Assessments Team course is intended for management-level personnel in government agencies, schools/universities, faith based organizations, and the private sector. Participants will be expected to participate in role-play exercises. At the completion of the course, participants will have developed a firm understanding on preventing and minimizing violence in the workplace. The Surveillance Detection Course instructs participants on the fundamental principles and methodologies of human surveillance. Through case studies and role-play exercises, participants will understand how to plan, execute, and assess a surveillance operation. Additional topics covered are solving ethical dilemmas, identities vulnerabilities, and conducting counter-surveillance. This course is intended for law enforcement, corporate safety, and school security personnel. These techniques and tactics taught in the course are based on the training curriculum of federal Jaw enforcement officers, and are actively used in today’s changing world. The Active Shooter Response course is designed to instruct civilians to respond effectively during a critical incident in order to prevent or minimize casualties. Participants learn critical techniques and approaches, created by federal law enforcement agencies, such as the Alert, Lockdown, Inform, Counter, and Evacuate (A.L.l.C.E.) method. The course also addresses active shooter responses on all levels from supervisory to the individual, and dispels many of the active shooter protection myths. This course is intended for any stakeholder in government agencies, schools/universities, faith-based organizations, and the private sector. Participants will have the opportunity to utilize the techniques they have gained in a simulated active shooter cenario where they will then debrief and reassess. This active learning approach will reinforce the course concepts and better prepare participants to respond to critical incidents. The Tactical Emergency Medical Care course is designed to train non EMS staff the lifesaving skills necessary to treat severely injured victims until professional medical personnel are on scene. This course, designed for school administrators and staff, is rooted in science and evidence from the highly esteemed military Tactical Combat Casualty Care doctrine, the Department of Homeland Security “Stop the Bleed” campaign, and the Hartford Consensus Study. The course information and training is presented in a manner that is effective for civilian, non-medical providers. The contemporary curriculum is presented in a relatively low stress environment, allowing the student to gain a better understanding of the knowledge, skills, and attitudes needed to provide lifesaving care in emergency situations. At the completion of the course, the student will gain a better understating of the preventable causes of death and will learn how to employ, simple but very effective lay person emergency care. This cutting edge course provides Superintendents, School Board Members and Administrators with the tools they need to provide our students the highest level of protection to further their charge under Article 28. (c) of the California State Constitution, Right to Safe Schools. This course will provide participants with a real-life approach to working with Law Enforcement, School Security Officers, and a working understanding of the roles and responsibilities of staff relating to providing a safe, secure & peaceful environment for learning to occur. Participants will be able to identify the difference between “Technical Direction” vs “Supervision” as it relates to School Resource Officers – School Police, School Security & Supervision Staff. Safe Schools Plans will be explored, as well as the legal and moral responsibilities associated with mandatory reporting items. The course is intended for School Board Members, Superintendents, Cabinet Members, District Student Services/Child Welfare & Attendance Administrators, Principals, Assistant Principals/Vice Principals, presidents/Vice Presidents, Deans, Coordinators & Managers. Prerequisite: Employment as a School Board Member or Administrator/Manager within a K-12 or College. Individuals presently enrolled in an Administrative/PPS Credential with CWA authorization or CBO Programs may register subject to Instructor approval. Students are encouraged to bring their “SAFE SCHOOLS PLAN” with them the first day of class.